I was cruisin through the MB section of D S last night and someone wondered if a CHILI PEPPER had been made. I was able to make one fairly quickly. The actual cut file does look a little better than this screenshot. I did some work on the stem cap so it isn't as angular and has a bit more curve. You are a awesome designer! wow Okie, reminds me of the chillie that made my mouth turn to fire!!!! when visiting friends in Mexico! They told me to down in one! Where was the water when I NEEDED IT????? LOL.... Thanks, may have to use this. LOL!!! This is sooo cool!!! Thanks for sharing!! Thank you for a great cut file. 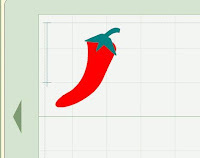 I have been looking every where for a chili pepper! Thank you so much for creating this - I am so excited to cut it out :) I appreciate your talent and hard work!